I’ve often been asked why I don’t use Chiron, or Juno, or any of the thousands of other asteroids in my interpretive astrological reading, or why don’t I place any importance on the south an north nodes of the Moon, (when we don’t use the nodal points of the the other planets)? Or why don’t I use the parts of fortune in a chart, which is an Arabic calculation? Let’s learn what WORKS & what DOESN’T when creating an astrological chart for your clients. There are numerous other Arabic calculations astrologers choose to ignore, such as the parts of necessity, the parts of courage, the parts of victory, lot of nemesis, lot of mother, lot of father, lot of siblings, lot of children, lot of marriage, lot of debt, lot of destroyer, lot of accusation, etc., etc. You get the picture. If you want to drown yourself in absurdity, then use them all. The best advise is “Keep it simple” and you’ll find yourself reading like a professional astrologer. I teach my students to stay focused on the nine primary planetary influences and stop chasing after the many cluttering influences in a chart that leave you confused, distracted, and befuddled with vague and fanciful interpretations which have no bearing on the powerful interpretive astrological tools given us by the masters of old. I’ve been asked about Sabian symbols and the like. Honestly, I find all this a waste of time, and I’ve researched these so-called interpretive tools in the nine solitude years spent in a cell researching and trying out the myriad of methodologies and techniques astrologers promoted, be it the German, Reinhold Ebertin, midpoint astrology or others. I’ve found that most of these methods bring vague and multi-interpretive meanings that open your imagination and interpretations into a fantasy world of meanings. I always instruct my students to explore and use any technique they choose, and if it works for them, so be it, but be careful not to stray too far from the simplicity and basic tenets of astrology, as taught by the old masters who laid the foundation stones of astrology to work and reveal the deepest insights into the nature of man. Why on earth do we need to clutter the astrological chart with even more, be it asteroids, parts of fortune, node points of the moon, or the nodes of other planets? Why select only two or even a dozen asteroids out of the tens of thousands in our solar system ? (They choose the biggest ones). The following computations will give you some insights into the mathematical scope of possibilities that arise form a basic astrological birth chart and the unlimited interpretations possible. So, mathematically, how many natal charts interpretations are possible? How many possible configurations of star charts are there? It is my understanding that there are a number of “houses”, “signs”, “planets” etc. Exactly one of these things can be “rising.” In theory, we could multiply out all of the possible combinations of houses, signs, planets effects to determine the precise number of possible astrological meanings. So, how many possible charts interpretations are there? The correct answer is infinity. But you can get a numerical answer depending on how much you simplify. There are twelve sun signs, 144 Sun-Moon combinations, and 1720 Sun-Moon-Ascendant combinations. That alone might make it extremely rare for you to find two people you know who share the same Sun, Moon, and Ascendant. But a chart will also include all solar system planets, Pluto, and sometimes Chiron, Vesta, and other small objects. Arabic parts and fixed stars don’t really count, as their positions are either fixed or derived from the Moon or houses. Sun, Moon, Mercury, Venus, Mars, Jupiter, Saturn, Uranus, Neptune, Pluto and Ascendant will account for 12 to the 11th power different charts, or about 700 billion different charts. You also have to consider that the planets and ascendants behave differently depending on their angle. A 5-degree Capricorn and a 28-degreeCapricorn are very different personalities, and that Sun will form different aspects to the remaining planets. So each sign can actually be considered 30. There are thirty different Aries, thirty Taurus and so on, leaving us with (30×12)11 maps, or about 13,000,000,000,000,000,000,000,000,000 (13 octillion) charts. 2 – Neptune and Pluto are very slow-moving and no one currently alive has lived through a full cycle of either of these planets. In a nutshell, there are many, many more possible astrological charts than there ever will be people on Earth. Consider that Mercury will never be more than 28 degrees from the Sun (one sign apart) and Venus will never be more than 47 degrees from the Sun (two signs apart). The fact that Pluto and Neptune move very slowly is not relevant as we are discussing how many charts are theoretically possible, and so we can take these planets into account as well, bearing in mind that there is no one currently alive having been born under either Pluto in Aries or Pluto in Taurus. (12 x 12 x 3 x 5 x 12 x 12 x 12 x 12 x 12 x 12 x 12) = 15 x 129 = 77,396,705,280 different interpretations. When taking the degrees into account, for each position of the Sun and Venus can be either -47 or +47 degrees (95-degree span) to either side, and Mercury+28 or -28 (56-degree span). 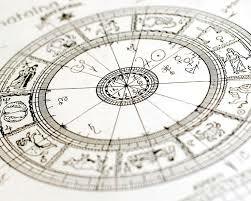 The zodiac is divided in 12*30 = 360 degrees, all of which are traveled by the Sun throughout the year. 360 (Sun) x 360 (Moon) x 56 (Mercury) x 95 (Venus) x 3607 (Mars, Jupiter, Saturn, Uranus, Neptune, Pluto, Ascendant) = 5,320 x 3609 = 5.4029896947597×1026 or about 540,298,969,475,970,000,000,000,000 (540 septillion different charts).